Sanjiv Sawhney has worked across almost every function of a securities services firm, taking him from India to Luxembourg and now London as Citi’s global head of custody and fund services. Global Custodian: How did you begin your career in securities services and what were some of your career highlights? Sanjiv Sawhney: I have been fortunate to be involved in a wide range of activities and functions over the course of my 27-year career in the securities services industry, spanning operations, technology, country and regional management as well as global business leadership positions. I graduated in engineering and economics in 1992, at a time when the mutual funds industry was growing internationally. I joined Citi in India, straight after university, within a technology division supporting the securities services business. At the time, in addition to the US funds industry, European UCITS products were also becoming large and globally distributed, and a number of Asian domiciles were growing in importance. I moved to Luxembourg in 1994 and worked in a variety of Operations roles at Citi Luxembourg, prior to being promoted to lead Citi’s European funds business. In 2007, I was hired by JP Morgan to head their Luxembourg office, which at the time, was the largest local Custody & Administration bank in the country. I was also responsible for JP Morgan’s European funds operations. I re-joined Citi in 2009 to run the global fund services business and moved to London in 2013 to lead Citi’s EMEA securities and funds services division. At the end of 2014, Citi built a new division combining the full suite of investor solutions across prime, futures and securities services and I was promoted to lead Citi’s custody and fund services business globally. SS: Even before I started working in global organisations, I was fortunate enough to have a decent international exposure. My father worked for a multinational company and I spent time in Hong Kong during my childhood and travelled to many countries. Working for a global organisation like Citi gave me the chance to work with teams and clients in many countries. We have clients and teams operating globally across time zones, and the ability to adapt in this international environment is an extremely important element of one’s working life. Having benefitted from the international perspective has allowed me to fit into and work effectively with diverse and global teams. SS: If you look at the clients we serve, their business is significantly larger in size than in the past, and they are much more complex in terms of fund structures and investment types. What used to be a single-domiciled investment product has become very international, with certain products sold in 60-70 countries, so setting up the necessary infrastructures to help them manage the challenges associated with their scale and evolving models has been essential. Regulation has become much more mature and defined, but that comes with complexity as many jurisdictions have different approaches and needs, which need to be incorporated into your business model and approach. On the operational front, our industry model has become more dispersed and functional. Years ago, a single fund accountant provided end-to-end processing for the fund he serviced. The growing size of the industry has meant we have had to decentralise and functionalise operations, leveraging the related scale & time zone differentials into the service model for our global clients. The fundamental role of the custodian has also shifted over the years. What started as a safe keeper of assets has now grown into becoming a strategic partner, performing activities much closer to the investment decision. 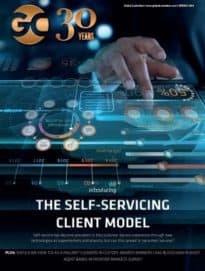 Service differentiation is provided by the rising importance of middle-office, transfer agency and data management services, in addition to the core existing functions of fund administration and custody services. SS – It has varied over the course of my career but overall having great time at work has always been linked to a strong sense of achievement in the role I have been performing. Being strategically relevant and delivering customised, top quality service to meet my clients’ needs makes for a good day. We service a large number of clients that are very demanding, so getting a good satisfaction score from them is a top priority. Our business is people-oriented and intensive so having a happy and motivated team is a key component of feeling good. When I am not travelling, spending quality time in the evening with the family rounds up a good day. SS: Firstly, I am convinced organisations – both on the buy side and sell side- will have to allocate their resources even more strategically and focus their budgets and strategies on areas where they add most value and can differentiate themselves. All of us will have to try to find ways where we can distinguish ourselves based on our strengths. Citi has done this by defining which core businesses, clients and geographies it will be a player in. The second trend is the consolidation in the industry at the asset manager end, and how this will trickle into securities services providers. Consolidation and scale will enable remaining players to operate more effectively. Thirdly, the industry will have to become even more agile to service new asset classes and product types. ETFs flows have exploded, and the rise of socially responsible asset classes is an increasingly important trend. Real assets and private equity investments are becoming more widespread and the ability for service providers to adapt is essential. The biggest change which will come in the next five years is how new technologies will shape the way the industry operates. Most of us have changed the scale and scope of the businesses we run – but the technologies we use have not moved at the same pace. This will fundamentally change going forward. AI, Robotics and Big data will fundamentally change the way we operate. Citi have worked extensively on our big data strategy. We have also focussed on innovating, using new technologies, either to bring industry-leading or industry-disrupting solutions to the market. SS: I do listen to a lot of diverse music, including a lot of Indian artists. I would however choose any Dire Straits album – it takes me back to my younger university days.